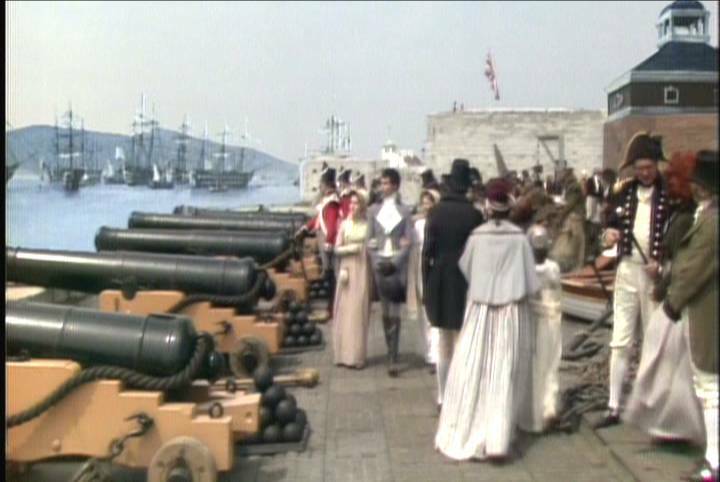 After a few chapters, though, our characters set sail for Jamaica, some of them aboard Alexandra the 74-gun man o’ war commanded by William, and some aboard Audacious, a slightly smaller 64-gun ship commanded by Captain Alban Parker. 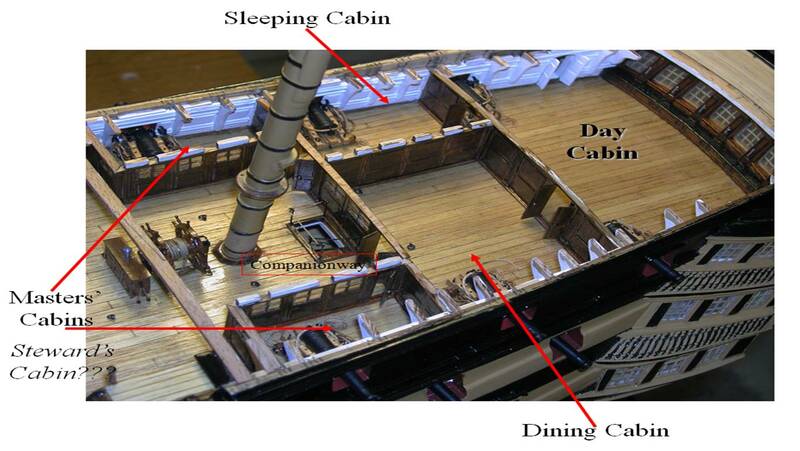 We get to explore much more of the ships, as we spend so much more time on them, in Ransome’s Crossing. 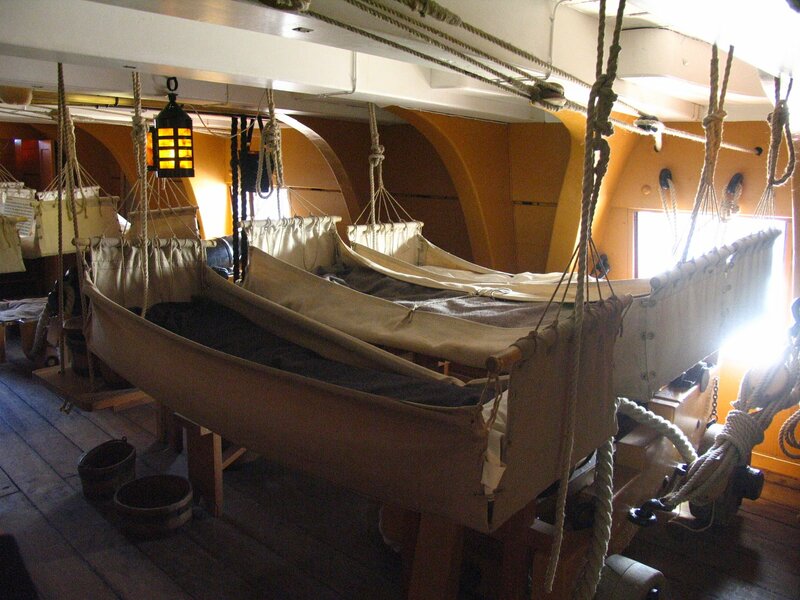 William’s—now William and Julia’s quarters aboard Alexandra, which include a hanging box-bed fashioned after Lord Admiral Horatio Nelson’s aboard HMS Victory pictured here. 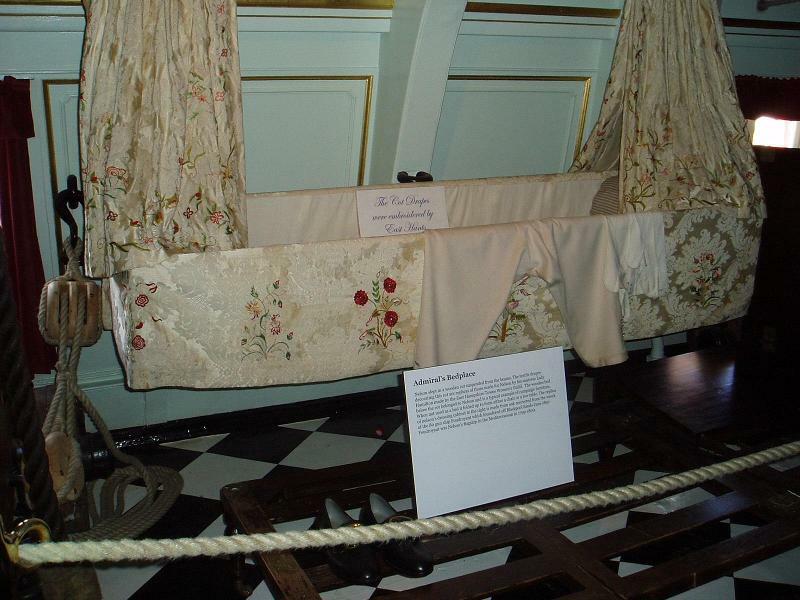 William and Julia’s bed is wider, of course. 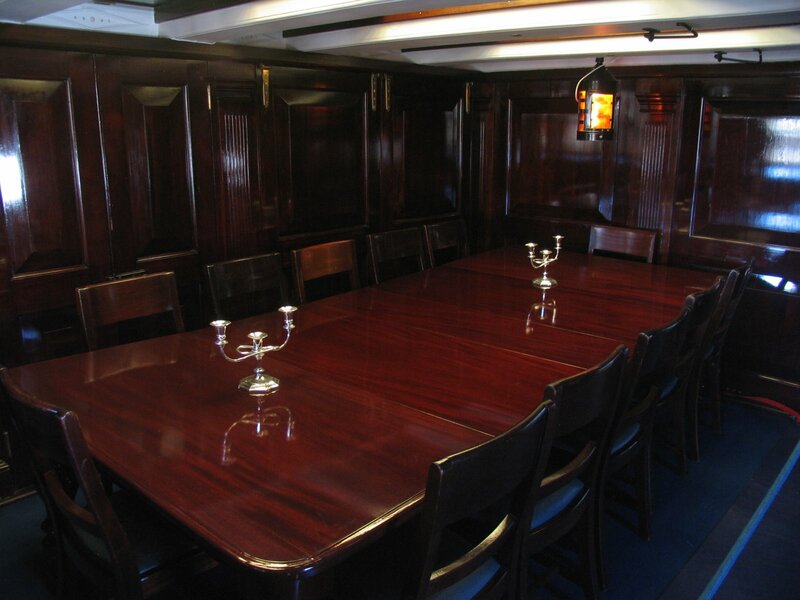 The wardroom—the common area the lieutenants’ quarters surround. 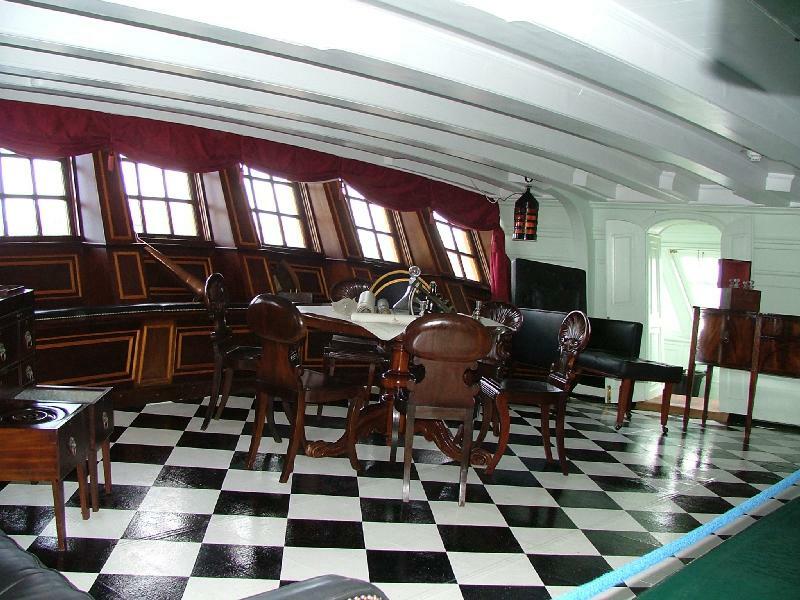 The wheelhouse, behind which is situated the captain’s quarters aboard Alexandra and Audacious, with the poop deck above. 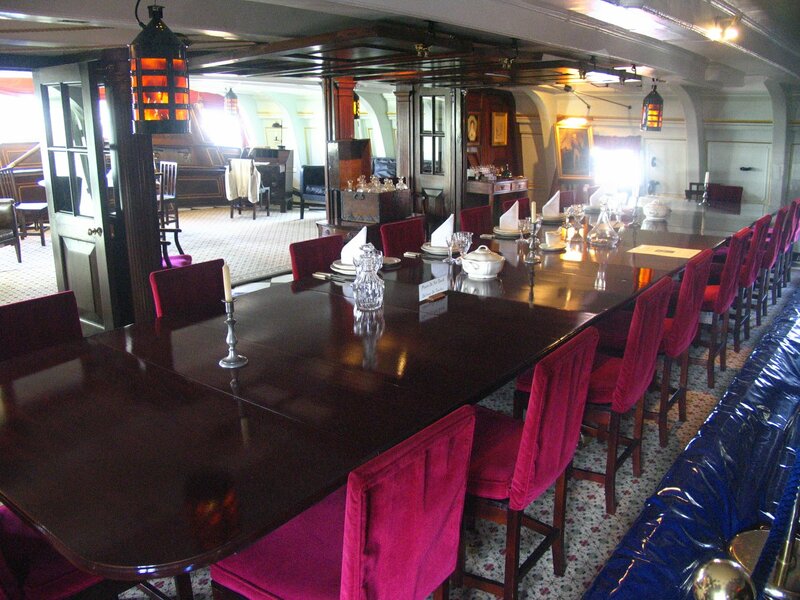 The dining cabin, situated between the wheelhouse and the captain’s main, or “day”/”big” cabin. 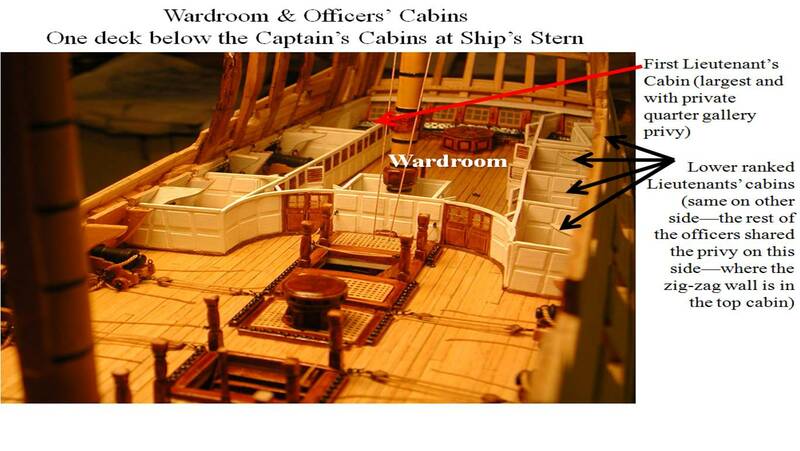 In case of battle, the bulkheads between the dining cabin and the big cabin were removable so they could get smaller guns (chasers) to the stern windows if needed. 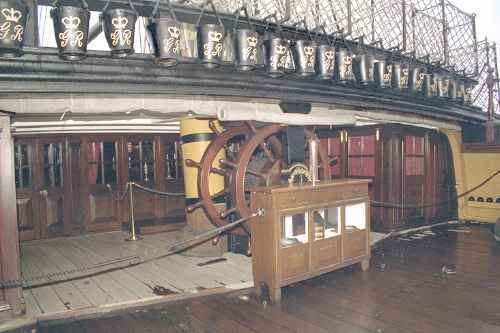 Unfortunately, there are no images I can find of the midshipmen’s berth—known as the cockpit—which was in the bow of the ship, unlike the officers’ cabins, where were at the stern, taking full advantage of the light from the stern windows. And then, we arrive at our destination . 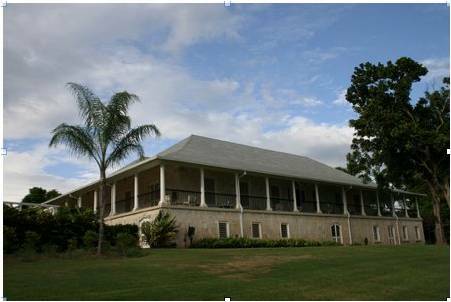 . . the Tierra Dulce sugar plantation. So now you can picture these settings the way I have, for the most part. This is me clapping my hands in complete happiness!! I LOVE seeing how you envision something and having pictures to refer to and remember as I’m reading the stories. It truly makes all the difference ~ and brings the story to life even more. I love having the pictures to refer to when I’m writing—that way I make sure I’m describing things exactly the same way every time. Especially important from book to book, but also within the same story. Thanks for sharing the pics! LOVE the plantation, especially! Funny thing about that . . . I had the image of the plantation clearly visualized in my head for a couple of years—a low, sprawling, white house with deep porches all the way around. It took me quite some time last night to find a place that matched it almost exactly (though I pictured it as being more of a clapboard-style house. 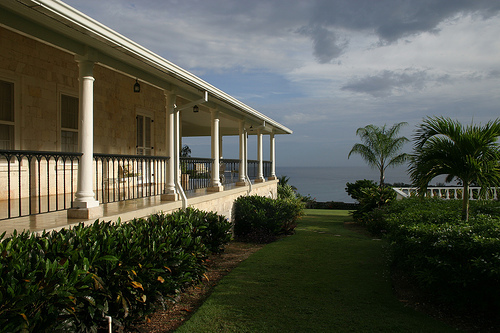 These are images of Mount Corbett Estate in Jamaica. Thanks for sharing all of these pictures! It definitely helps me see things better. Can’t wait to read this book! I can’t wait to hold this book in my hands. With its release date next week, I keep expecting a knock on my door from the delivery guy with a couple of boxes of books! I love seeing these pictures! The books come so much more alive after viewing these images. 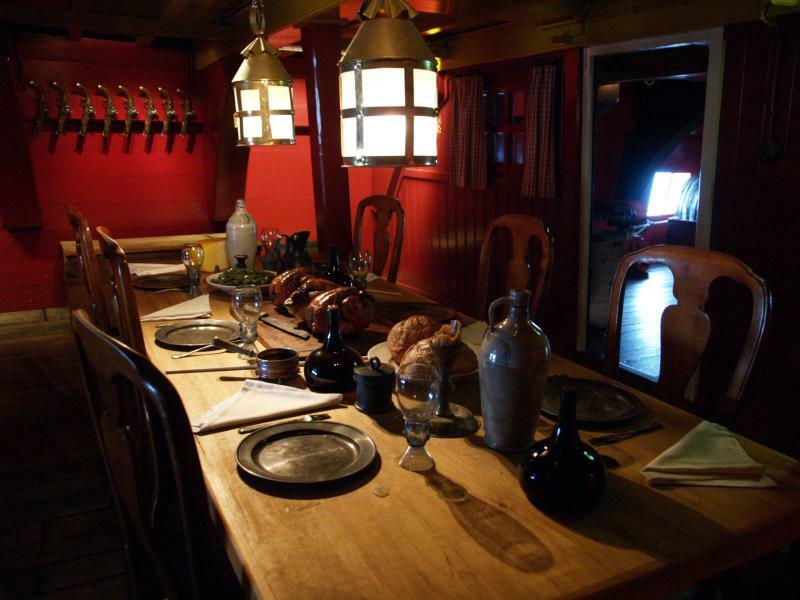 Is that a grand piano I see in the corner of the day cabin? Ahhh……the sugar plantation! Just beautiful! My dad’s parents were missionaries in Jamaica for about three years. Daddy was born there during a hurricane. The hospital roof blew off, so my grandma had to hold an umbrella over her new baby. The nurse decided to curl up at the end of my grandma’s bed to sleep and chickens would be running in and out of the room! I believe what you’re seeing that looks like a piano is actually a desk. 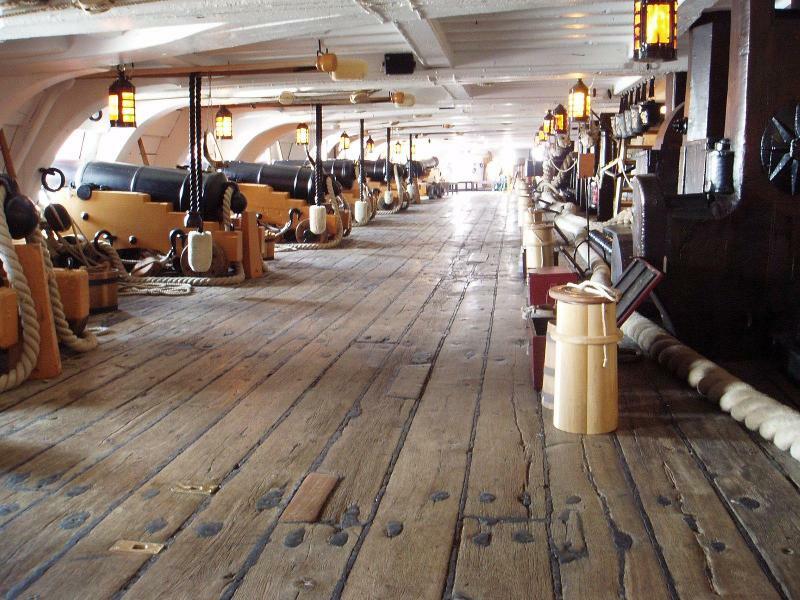 You should come to Boston – I’ll take you on a tour of Old Ironsides! You would love it. The museum is great too. I would LOVE that! I’d hoped they’d have something similar in Charleston, where I’ll be in two months for a cousin’s wedding, but, alas, the one they have on display is an aircraft carrier. ::sigh:: One of these days, I will make it to Boston, though! There’s so much there I want to see. There’s a plantation house in the movie Reap the Wild Wind starring Paulette Goddard and John Wayne. It’s in Key West though, not Jamaica. I think it’s on YT. I’ll have to go see if it’s a clapboard style house. The inside was probably done in a studio set. I just went and looked at a picture of the house at a fan site. It’s probably smaller than what you were thinking. What great research – and fun too, I’d say. I searched realty in England for the houses I used – you can get the blueprints of the houses that way. Just by doing that, it changed one of the plotlines of my story because I discovered…subterranean passageways leading from the house. Woohooo! Great fun. I can get so caught up in doing this kind of image research that it takes time away from other work I should be doing (like the editing I get paid for or actually writing the story). But the right images can generate so many ideas, it’s worth the time. It’s really amazing to me how much they managed to fit on ships (and still do today for that matter) the photos really help with that part in particular since it’s so foreign to me. I’m impressed with your research…and appalled at the close quarters which are certainly going to make Ransome’s Crossing intriguing! Charlotte captured my interest in Ransome’s Honor and I can’t wait to read her story. Thanks, Kav. I’ve said it before—it wasn’t until Charlotte burst onto the scene and demanded a POV in Ransome’s Honor that the entire storyline of the trilogy fell into place. But everything that went into researching the setting, as well as writing a battle scene, really had me cowed when writing RC—until deadline came upon me and made me break through those inhibitions and start paying attention to the movie playing in my head and stop listening to my self-doubt and fears that I’d never be able to get it written the way I envisioned it happening. Great settings! We watched a bit of Master & Commander yesterday. I can’t watch that movie now without thinking of your Ransome books! I’ve been known to spend a bit too much time tracking down visual references too, but agree they can go a long way in helping to bring them to life on the page. I have always wished that I grew up in an earlier time period, but I have to admit that I like my sweat pants and my private bathrooms too much. I would not have known any different then and it would have been nice to grow up when things were so different.